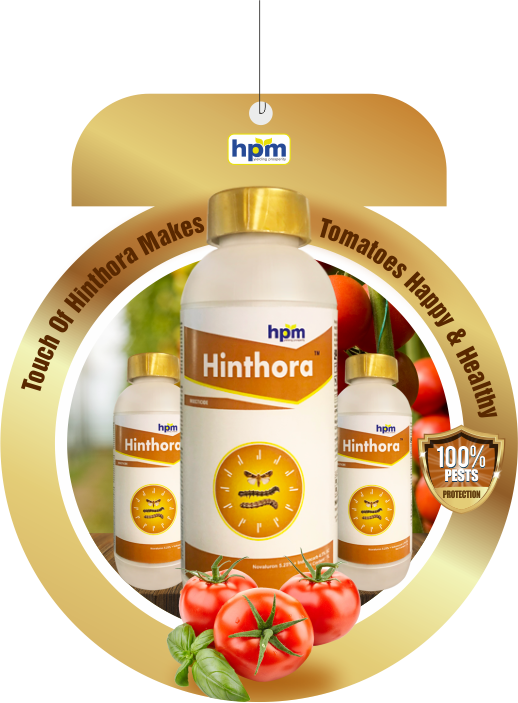 Hinthora is a broad spectrum insecticide. It is used for control of wide range of lepidopteron insecticide e.g. Helicoverpa armigera and Spodoptera litura in tomato. It is a ground-breaking product with twin mode of action i.e. contact and stomach. It also affects on chitin synthesis inhibitor by restricting the moulting. Hinthora acts on nervous system of insect and paralyses the insect results to death. It also has phytotonic effect on the crop. Hinthora is available in the pack sizes of 50ml, 100ml, 250 ml, 350ml, 500ml and 1ltr. Novaluronis chitin synthesis inhibitor,affecting moulting. Indoxacarbblocks sodium channel in nerve cells. Novaluronabsorbed mainly by ingestionbut shows some contact activity. Causes abnormal endocuticular deposition and absorptive moulting. Effective against larvae, but also has a toxic effect on eggs of some species and, in some cases, reduces fecundity. Indoxacarbinsecticide active by contact and ingestion, Affected insects cease feeding, with poor co-ordination, paralysis and ultimately death. It is used for control of wide range of lepidopteron insecticide e.g. Helicoverpaarmigera and Spodopteralitura in tomato. It is a ground-breaking product with twin mode of action i.e. contact and stomach. It also affects on chitin synthesis inhibitor by restricting the moulting. It acts on nervous system of insect and paralyses the insect results to death. It also has phytotonic effect on the crop.